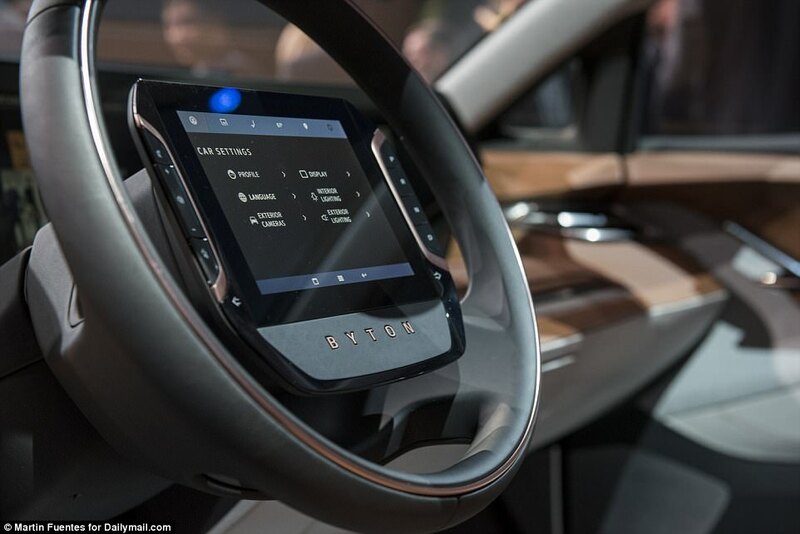 The firm finally unveiled its first drivable prototype at the Consumer Electronics Show in Las Vegas today, after teasing the so-called Smart Intuitive Vehicle (SIV) since September. The Nanjing-based company plans to roll out the mid-sized crossover vehicle with level 3 autonomy in China in 2019, starting at $45,000, before hitting the US and Europe in 2020. The base model will be able to achieve 250 miles on a charge, while the higher end variant will go up to about 325 miles – and, the firm claims it will charge incredibly fast. Byton claims it is on the verge of achieving a fast-charging system that will ‘get enough charge for a whole week of urban commuting’ in just the amount of time it takes you to have a cup of coffee. 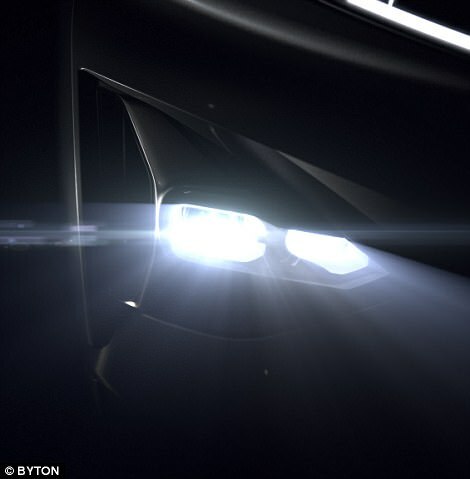 Onstage at CES, co-founder Dr Carson Breitfeld said the car will recharge to a range of 150 miles (249 kilometers) in just 20 minutes. And, in just 30 minutes, the battery will be 80 percent full. As a result, much of the focus has been put into its smart human-vehicle interface. The car is essentially a ‘smartphone on wheels,’ a Byton test driver said during the Las Vegas event. 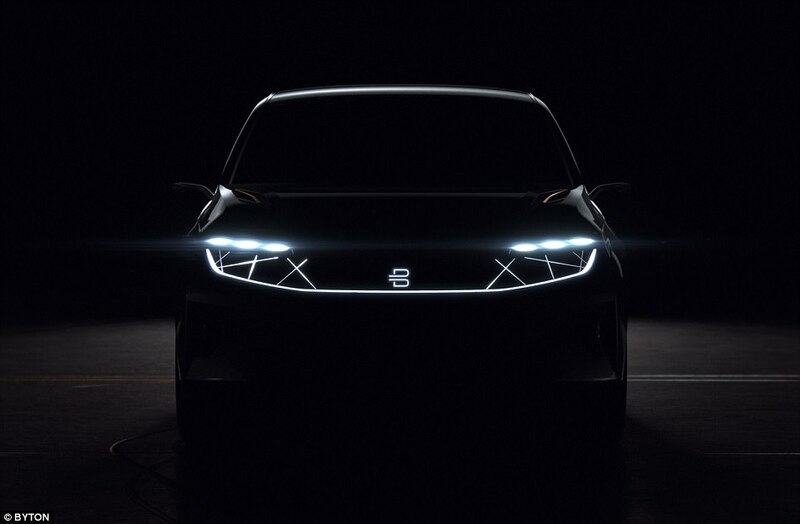 It will be equipped with gesture recognition, facial recognition, and even emotion recognition, to differentiate between the driver and passenger and personalize the rider experience. Safety is the ‘underlying principle,’ of the design, Breitfeld explained. 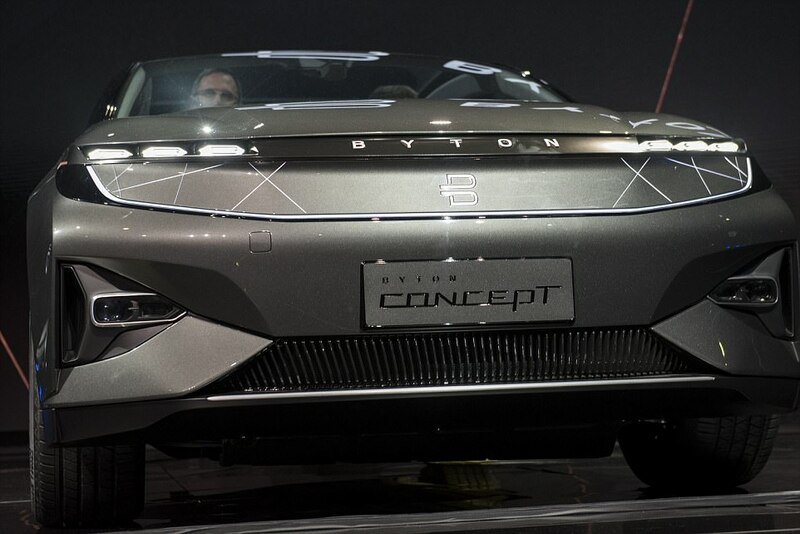 The car will respond to conditions on the road to avoid potential threats; for example, ‘if the exterior lighting conditions change, your Byton will adjust to your needs automatically,’ the co-founder said. It also has a touch screen built right onto the steering wheel, in what the firm claims is a world first. It also has voice control with Amazon’s Alexa, and an intuitive gesture control system that responds to 5 different hand commands. The car is designed to be smart and sleek, with invisible door handles and flat antennas integrated into the roof, eschewing the ‘shark fins’ common in current vehicles. 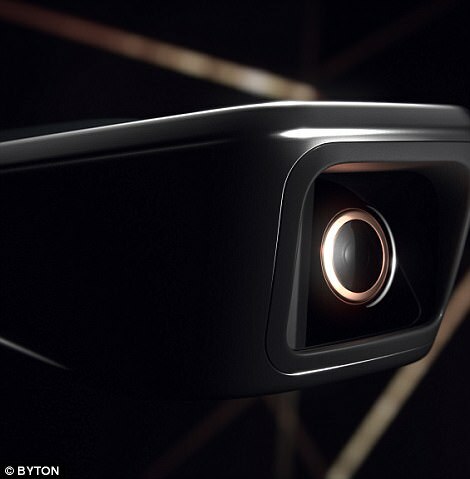 It will also feature an array of cameras instead of side view mirrors. The interior aims to provide a ‘digital lounge experience,’ explained Dr Breitfeld. From the get go, Byton says the car will be equipped with Level III autonomy features, with Level IV to come in the next year or so. It will have fitness tracking capabilities, with the capabilities to monitor heat rate, blood pressure, and oxygen level. 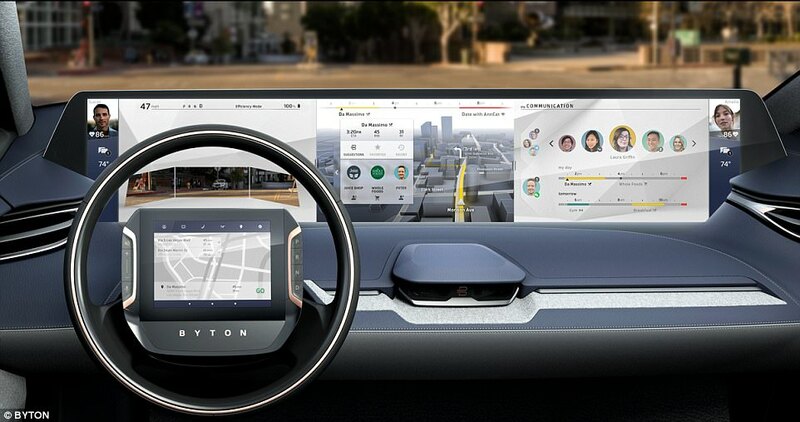 Photos released prior to its official unveiling showed off the tech-packed interior of Byton’s flagship car, with large touchscreens mounted on the back of the driver and passenger seats for riders in the back to enjoy. And, it will have a massive 49- by 10-inch touchscreen display spanning the length of the dashboard. The firm claims it will provide users with constant connection, with a bandwidth roughly five times higher than conventional systems, at up to 1000Mb/s. 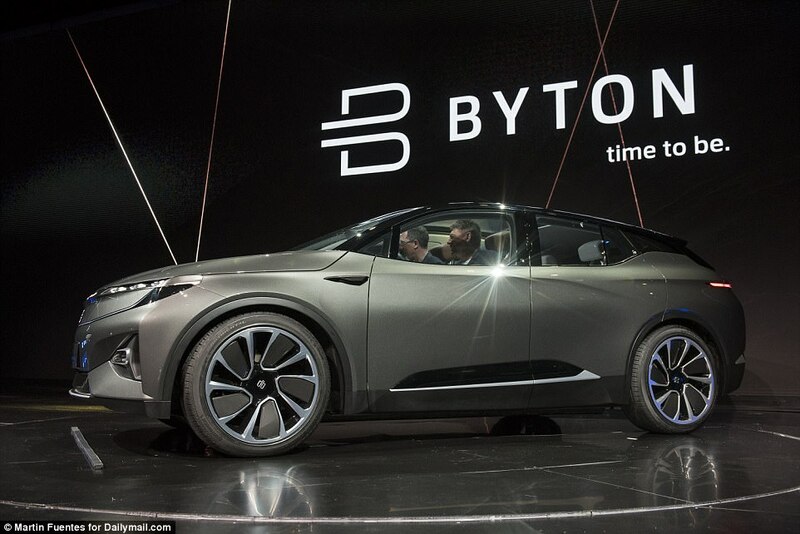 This is also roughly 100 times faster than your smartphone, Byton noted during the unveiling event. This means passengers can stream TV shows, play games, and video chat through the car. The cars will also be able to read traffic signs, monitor blind spots, and communicate with other cars using an array of sensors and advanced image processing. 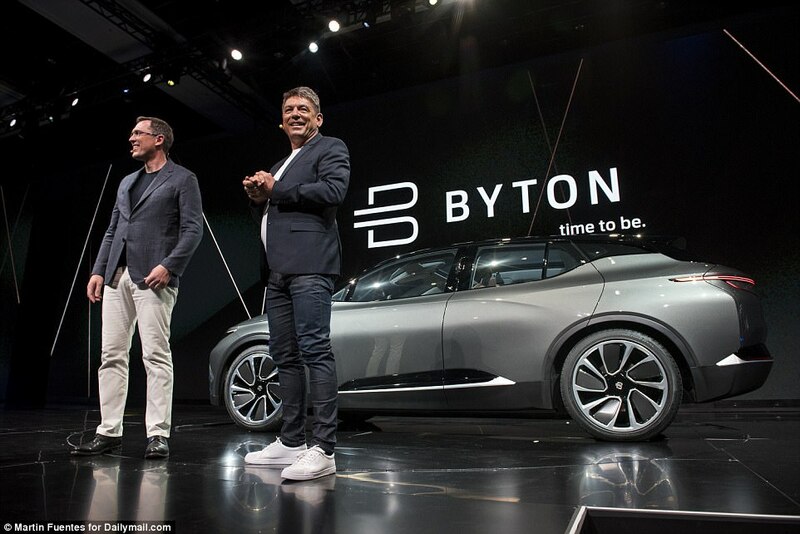 Byton says it will launch three models with this platform in the next five years. This will include an SUV set to launch in late 2019, plus a sedan and MOV that will hit the market in 2021 and 2022, respectively.